-- according to Nobel Laureate Richard Smalley, by the end of 2010 (just months from now) 90% of the world's scientists and engineers with advanced degrees will live in Asia. -- 80% of people being trained in the advanced physical sciences in the United States are from abroad. -- because the opportunities are now greater abroad, we are no longer retaining them in the USA. -- If we do not turn this trend around, we will have outsourced innovation. And once we have outsourced innovation, our country's ability to compete will be over. My concern over this is so great that I have devoted the past year and a half (7 days a week 10 hours a day) to organizing this Science Festival." Mr. Bock hopes that the festival in Washington D.C., with smaller collaborative festivals across the country, will help invigorate new interest in science in this country. That's why we're participating as well. 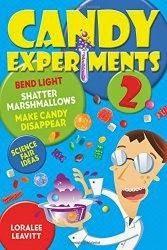 Maybe one of the children who tries candy experiments will go on to major in chemistry. And maybe all of the people who try candy experiments will leave excited to try new things, to pursue answers when they wonder "What if...?" To learn more about events at the USA Science and Engineering Festival, or to look up participating events in your own area, check out their website. We'll be there Oct 23-24 on Pennsylvania Avenue near Freedom Plaza.